I've been watching AMVs forever and I keep seeing this little maid pop up in them that's in a green dress with blue and red eyes or something like that. She keeps yelling "DESU!" all the time. I think it's even a meme now, but I missed the boat on this one. So please, what anime is the DESU maid from? According to Know Your Meme the character is Suiseiseki from Rozen Maiden where she ends every sentence with "desu" (pronounced /desu̥/). 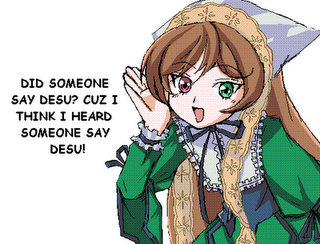 The character Suiseiseki from the anime series Rozen Maiden ends every sentence with desu. Im assuming that is what your talking about. Not the answer you're looking for? Browse other questions tagged story-identification anime meme or ask your own question. Movie with forest eating the moon? Anime about half-human girls who fight monsters?